Laser Cutting or Water Jet Cutting: Which is Best for Your Application? When it comes to digital manufacturing cutting techniques, there are several options, that can each take the information from your 2D file in order to create your object directly. These techniques are great for rapid prototyping or production. The two main custom manufacturing methods are laser cutting and waterjet cutting. Today, we will compare those two techniques, and see which one fits which application best. Laser cutting is a subtractive manufacturing technique that uses a focused laser to cut or engrave the material. The beam is guided by mirrors. It can rely on a gas for energy. 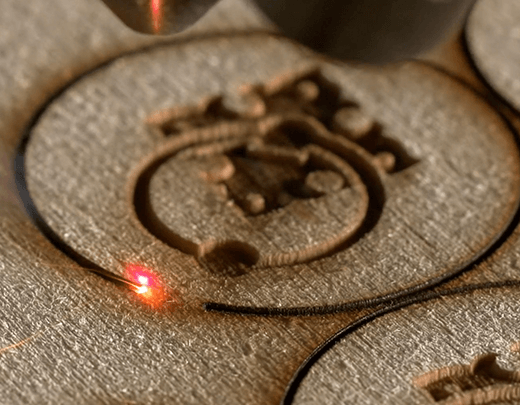 In this article, we talk specifically about CO2 laser cutters, since this is the type of machine we use in our laser cutting service. Excess material can be expelled from the cutting table using an additional gas jet. When the laser hits the material, the generated heat burns and cuts the material sheet very precisely. Learn more on our Laser Cutting glossary page and laser cutting service page. Water jet cutting is another subtractive manufacturing technique but it uses pressurized water focused in a very small point to cut the material. The pressure can be as high as 60000 pounds per square inch (4137 bar). The water can be mixed with an abrasive such as garnet, which increases its cutting possibilities (more materials, closer tolerances). Learn more on our Waterjet cutting glossary page. Which operations can laser cutting and waterjet cutting perform? A laser cutting machine can engrave as well as cut material, while waterjet only allows cutting. Laser engraving is an advantage if you want to directly add serial numbers, assembly marks, or simply aesthetic designs. Waterjet cutting partially enables 3D material cutting (though it is not designed for this purpose), while laser cutting doesn’t. As for material combinations they are also to avoid with both techniques: for laser cutting, it will pose a problem if the two materials have different melting points; for waterjet cutting, there is a danger of delamination. To sum up, both techniques are mostly used to cut 2D objects, and laser cutting can additionally perform engraving. What kind of material and what material thickness can each technique cut? Laser and waterjet cutting can both cut difficult materials. Laser cutting can cut a wide range of materials: all plastics, glass, woods, and metals, excluding highly reflective metals. Indeed, metal laser cutting is totally doable and you can laser cut stainless steel, aluminium or mild steel for example. All materials can be cut with waterjet cutting. 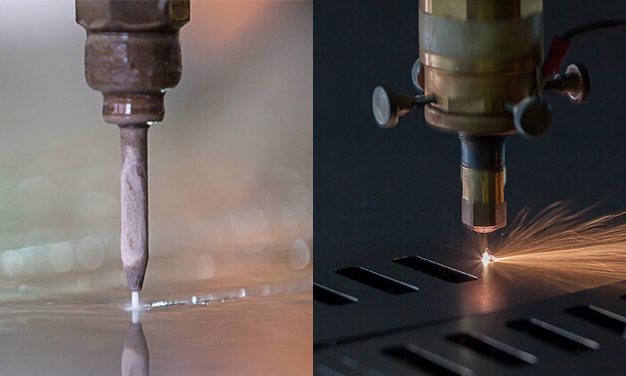 Laser cutters can cut thick materials, but a waterjet machine can cut thicker objects, the optimal thickness being 0.4’’ to 2.0’’ (10 to 50 mm), while for laser cutting, it is 0.12’’ to 0.4’’ (3 to 10 mm). What’s the level of precision of each cutting technique? Laser cutting is much more precise than waterjet cutting. The minimum size of the cutting slit is 0.006’’ (0.15 mm) for laser cutting and 0.02’’ (0.5 mm) for waterjet. As for their processing tolerance, it is of approximately 0.002’’ (0.05 mm) for laser cutting and 0.008’’ (0.2 mm) for water jet cutting. Can the cut material get damaged? Each technique is posing its own problems when it comes to part integrity. Indeed, laser and waterjet machines can both damage a little the material during the manufacturing process. Laser cutting can cause some burn marks on the material, and make the cut sides dark. In a lot of cases, the burn marks can be removed with cleaning: it’s the case for our POM material and our three laser cutting metal options. 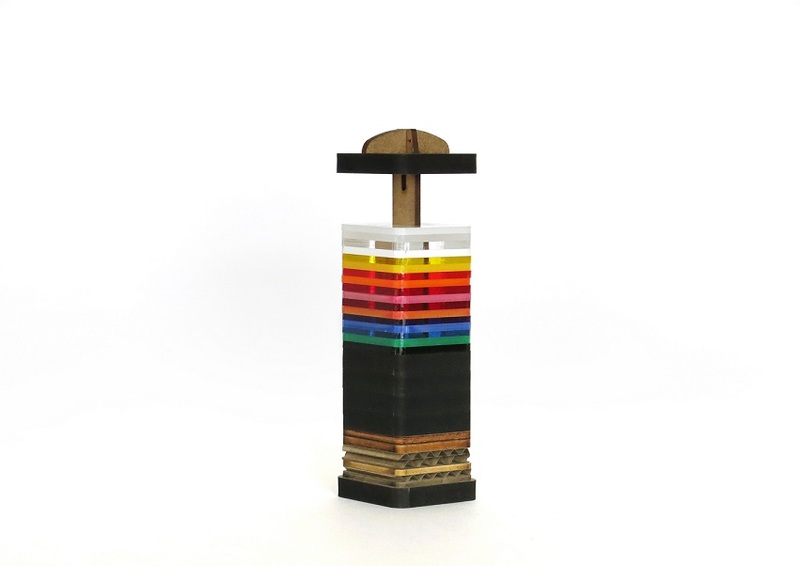 As for the darkening of the sides, it simply needs to be taken into account when thinking the design of your object: if you wish to laser cut a part in our MDF or plywood materials, for example, you can play on the contrast of colors between the colored faces and the black sides. On the contrary, our acrylic and cardboard materials won’t be marked at all. On the other side, waterjet cutting doesn’t require heat, but it applies very high forces on the material, which can pose problems for small parts, which might get deformed, or even not be able to be cut. Noise, danger, maintenance, waste: what’s the level of nuisance of laser cutting and waterjet cutting? Laser cutting involves very low risk, waste and required clean-up. The use of laser cutting machines doesn’t require safety goggles, even though it’s always good to wear some and be extra safe. However, for some materials, the dust and smoke produced can be slightly toxic, and it’s essential to have proper ventilation. Noise pollution is very low with laser cutting. And after the cutting process the machine doesn’t need to be heavily cleaned, as the cutting waste is mostly dust that can be vacuumed. 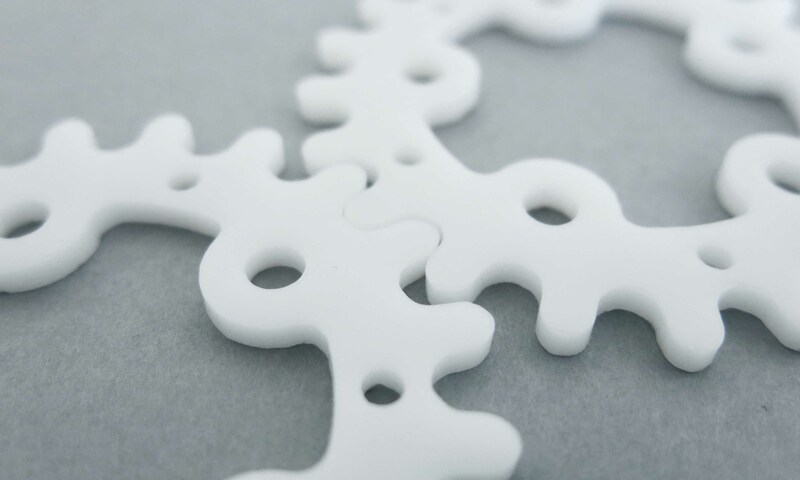 One of the problems linked to laser cutting is the thermal stress that can occur on the heat affected zones. To avoid a thermal stress cracking, the speed can be adapted. On the contrary, waterjet cutting involves more risks, high noise pollution, and high clean up. Indeed, the process is extremely noisy and requires ear protection. Protection is also needed against the pressured water jet (specific gears and covers, safety glasses). Moreover, the cutting area gets quite messy, with large quantities of cutting waste caused by the mixing of water and abrasives. Conclusion: Laser cutting or Waterjet cutting: which technique for your application? 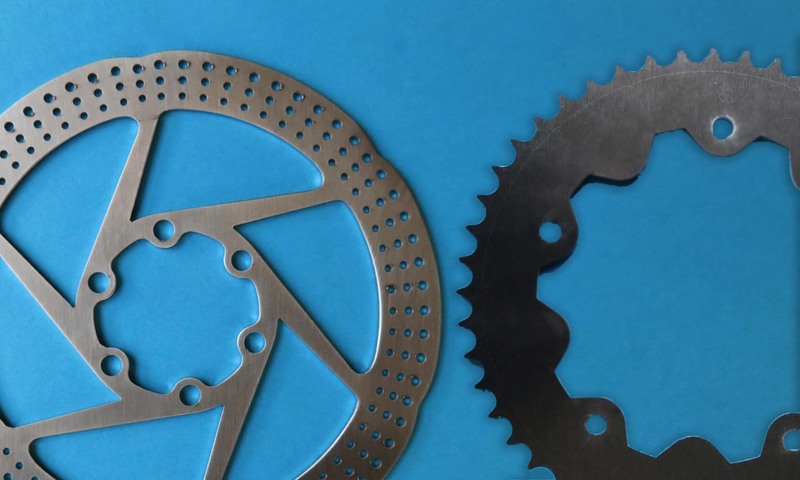 The point of this article is not to decide which is best between laser cutting and waterjet cutting, but to point out their differences, and to help you decide which one is best for your application. To summarize very briefly the points we have seen: laser cutting offers higher precision, is more fitting for detailed objects, or when you require engraving; on the other hand, waterjet cutting can cut through thicker sheets and has virtually no material restrictions. 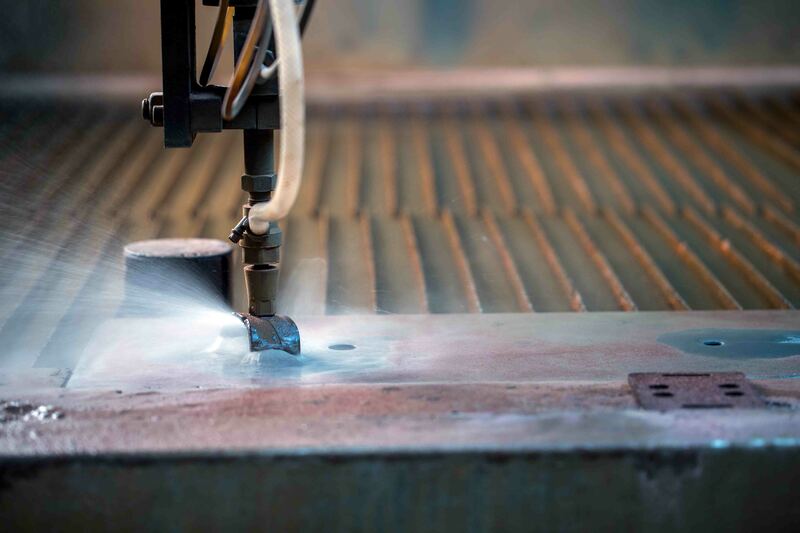 If what you are looking for is not just a way to realize your 2D design, but a machine to invest into, it’s also important to take into account the fact that waterjet cutting is extremely noisy and requires more clean up. If you want to learn more, you can read our laser cutting service page, or our laser cutting and waterjet cutting glossary entries. You can also download our free ebook, the Ultimate Guide to Laser Cutting, or visit our laser cutting materials catalogue. To learn how to prepare your 2D file for laser cutting, you can also visit our laser cutting tutorials (for Illustrator, SketchUp, and Inkscape). You can also upload your 2D file on our platform and receive your laser cut part within a few days.